When China Mieville’s The Scar — still my favorite book of his — came out, I was working for an over-the-air sci-fi-themed radio show which shall remain nameless. They booked an interview with Mieville, and as the board-op, I called him (I’m guessing at his hotel in Los Angeles or wherever he was), thanked him for being on the show, and potted him up when it was time for him to go on. The hosts talked to him about the novel, which was noteworthy to them I guess because it had a vampire in it. After about 15 minutes, they thanked him, and it was over*. 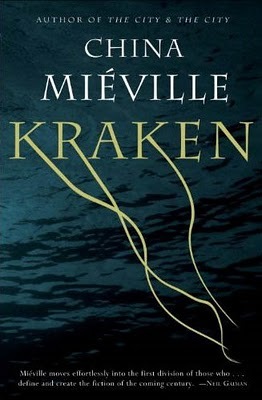 Mieville’s latest novel, Kraken, is about a giant squid in the same way The Scar is about a vampire. Following the quest of museum curator Billy Harrow to recover his mysteriously vanished prize exhibit, the giant squid Architeuthis, Kraken plunges Billy and the reader into an alternative London of cults and magic. The main character, Billy Harrow, is about 30, intelligent, a little geeky (but not too much), and non-violent. Stuff happens to him. Eventually he takes control of that stuff. Dane is a guard who is the key to the world of weird, and while our MC didn’t like him at first, it turns out he’s quite an important character. There’s a trio of policemen who want Billy to work for them, and they come off kind of like Smith in the first Matrix, but it turns out that, hey, they’re not all bad. Wisecracking female cop who knows more than her colleagues? Check. Small god who is very helpful but can’t actually do anything. This is the big one, the one that really ripped it for me: while the Big Bad Guys are the usual sort, it seems like most urban (or regular) fantasy contains two guys who speak with a funny patois or patter to their speech, are ruthless, love their jobs, and are feared by everyone. Yep. They’re totally there. And they commit murder and inventively-violent ways which, to me, seemed far too over-the-top even for Mieville, who, in the past, has had the arms of a dead child grafted onto its mother’s face as a form of punishment. After the first 100 pages or so, I got into the swing of things and the generic feel of the characters went away. The use of conventions makes sense — it allows a fantasy reader to jump right into the world through the use of familiar characters, and casual readers are able to map character types onto the kind of characters they’re used to in, say, political thrillers or romantic comedies, thereby making what is often a very tough book to read just slightly easier. And make no mistake: this isn’t the easiest book in the world to read. Mieville knows a lot of words, and he makes no bones about using them all — and not just in the order you’re used to. His writing is almost gymnastic in nature, and it forces you to pay attention to every bit of it in order to ensure you don’t miss anything. It’s really tough on those of us who are quick readers. He also continues to use very visceral and phantasmagoric verbal imagery — something I noticed in the New Crobuzon books — and, while it adds strength to the storytelling, sometimes it just gets tiring to have to think so hard about the words, instead of what they’re saying. (For example, when the Final Boss is revealed, and the monologue is given, I had trouble remembering the various clues that were given throughout the rest of the story as the Final Boss explained them.) I don’t mind working hard to read a book, but it can be too much from time to time. I really enjoyed the book’s humor and genre awareness — for example: if you give a Star Trek fan the magical power to teleport, of course he’s going to beam everywhere he can. And speaking of Trek, one of Billy’s primary weapons throughout the novel is his phaser. It really works. In some places, Mieville basically says “yeah, this genre convention is crap, here’s how it really is when a magical practitioner does it”. That works too. One of his strengths is that every little bit of the world is fully-realized, which means the novel is packed full of little moments of win. Also on the positive column is the sheer amount of cool and different powers the denizens of London possess. Smoking reality, teleportation, burning something so thoroughly it never even existed, creating a demonically-possessed iPod… there are dozens, and they’re all interesting. As are the end-of-the-world cults and the weird religions, the Embassy of the Sea, and the penultimate Boss Fight (think Jenova, with the final boss being Sephiroth). Kraken is Mieville at his creative best, building a detailed and immersive world with a complex and layered plot that — in this case, quite literally — could mean the end of the world. The novel certainly has its flaws, as I noted above, but it’s definitely a good story, exciting and enjoyable to read. It’s no The Scar, but I think it’s a better book than The City and The City (which I didn’t really enjoy that much). I for one would’ve preferred another visit to New Crobuzon, but this is almost as good. * One would think the guy who had actually read the first novel in the New Crobuzon cycle might have helped in the prep for the interview. But that didn’t happen. If only I’d known how big a fan of Mieville’s I’d become, I’d have gotten in on the ground floor there.